Amour (pronounced: [a.muʁ]; French: "Love") is a 2012 French-language romantic drama film written and directed by the Austrian filmmaker Michael Haneke, starring Jean-Louis Trintignant, Emmanuelle Riva and Isabelle Huppert. The narrative focuses on an elderly couple, Anne and Georges, who are retired music teachers with a daughter who lives abroad. Anne suffers a stroke which paralyses her on the right side of her body. The film is a co-production among the French, German, and Austrian companies Les Films du Losange, X-Filme Creative Pool, and Wega Film. The film was screened at the 2012 Cannes Film Festival, where it won the Palme d'Or. It won the Academy Award for Best Foreign Language Film at the 85th Academy Awards, and was nominated in four other categories: Best Picture, Best Actress in a Leading Role (Emmanuelle Riva), Best Original Screenplay (Michael Haneke) and Best Director (Michael Haneke). At the age of 85, Emmanuelle Riva is the oldest nominee for Best Actress in a Leading Role. At the 25th European Film Awards, it was nominated in six categories, winning in four, including Best Film and Best Director. At the 47th National Society of Film Critics Awards it won the awards for Best Film, Best Director and Best Actress. At the 66th British Academy Film Awards it was nominated in four categories, winning for Best Leading Actress and Best Film Not in the English Language. Emmanuelle Riva became the oldest person to win a BAFTA. At the 38th César Awards it was nominated in ten categories, winning in five, including Best Film, Best Director, Best Actor and Best Actress. The film goes back to several months before the opening scene, and Anne and her husband Georges (Jean-Louis Trintignant), both retired piano teachers in their eighties, attend a performance by one of Anne's former pupils, Alexandre. They return home to find that someone has unsuccessfully tried to break in to their apartment. The next morning while they are eating breakfast, Anne silently suffers a stroke. She sits in a catatonic state, not responding to Georges. She comes around as Georges is about to get help, but doesn't remember anything that took place. Georges thinks she was playing a prank on him. Anne is unable to pour herself a drink. Anne undergoes surgery on a blocked carotid artery, but the surgery goes wrong, leaving her paralyzed on her right side and confined to a wheelchair. She makes Georges promise not to send her back to the hospital or into a nursing home. Georges becomes Anne's dutiful, though slightly irritated, caretaker. One day, Anne tells Georges that she doesn't want to go on living. Amour was met with widespread acclaim from critics. Review aggregation website Rotten Tomatoes gives the film a score of 93% based on 198 reviews, with an average rating of 8.7/10. The site's critical consensus reads: "With towering performances and an unflinching script from Michael Haneke, Amour represents an honest, heartwrenching depiction of deep love and responsibility." Metacritic gives the film a weighted average rating of 94 out of 100, based on reviews from 44 critics, indicating "universal acclaim." ↑ "Amour - Zurich Film Festival". Zurich Film Festival. Retrieved 30 December 2012. ↑ "Amour - Love (12A)". British Board of Film Classification. 14 September 2012. Retrieved 23 January 2013. 1 2 "Amour at The Numbers". The Numbers. Retrieved 16 March 2013. 1 2 3 Lemercier, Fabien (2010-11-22). "Ile-de-France backs Haneke's Amour". Cineuropa. Retrieved 3 June 2011. ↑ "Oscars 2013: Full list of winners". BBC News. 25 February 2013. Retrieved 25 February 2013. 1 2 "Hanke's Amour geht fuer Oesterreich ins Oscar Rennen". Der Standart. Retrieved 4 September 2012. 1 2 "Oscars: Hollywood announces 85th Academy Award nominations". BBC News. 10 January 2013. Retrieved 10 January 2013. ↑ Walker, Tim (10 January 2013). "Quvenzhané Wallis v Emmanuelle Riva: Best actress Oscar contested by oldest and youngest ever nominees". The Independent. London. Retrieved 10 January 2013. ↑ "Amour leads European Film Award nominations". BBC News. 5 November 2012. Retrieved 4 November 2012. ↑ "US critics reward Cannes favourite Amour". BBC News. 7 January 2013. Retrieved 7 January 2013. 1 2 "Bafta awards 2013: Full list of nominees". BBC News. Retrieved 8 January 2013. ↑ Brown, Mark (10 February 2013). "Baftas: stars dress for show not snow as awards hail director Ben Affleck". The Guardian. London. Retrieved 11 February 2013. ↑ "'Argo', Affleck take top prizes at BAFTAs". CNN. 11 February 2013. Retrieved 11 February 2013. 1 2 "Amour among contenders for 2013 Cesar Awards". BBC News. 25 January 2013. Retrieved 26 January 2013. ↑ "Michael Haneke film 'Amour' sweeps major César awards in Oscars warm-up". euronews. Retrieved 23 February 2013. ↑ "'Amour' sweeps France's César awards". France24. Retrieved 23 February 2013. ↑ "Love (Amour)". filmsdulosange.fr. Les Films du Losange. Retrieved 3 June 2011. 1 2 "Amour". Screenbase. Screen International. Retrieved 3 June 2011. 1 2 Rohter, Larry (2 November 2012). "Michael Haneke Directs Amour, With Jean-Louis Trintignant". New York Times. Retrieved 30 December 2012. ↑ "Article The Curzon Interview: Michael Haneke". Curzon Cinema. Retrieved 30 December 2012. 1 2 Foundas, Scott (2012-12-20). "Michael Haneke on Amour: "When I Watched it with the Audience, They Gasped!"". The Village Voice. Retrieved 12 January 2013. ↑ Kemp, Stuart (2011-05-13). "U.K.'s Artificial Eye Boards Michael Haneke, Laurent Cantet Projects (Cannes)". The Hollywood Reporter. Retrieved 3 June 2011. ↑ "Amour". Rotten Tomatoes. Flixster. Retrieved 27 November 2012. ↑ "Amour". Metacritic. CBS. Retrieved 27 November 2012. ↑ Bradshaw, Peter (May 20, 2012). "Cannes 2012: Amour – review". London: The Guardian. Retrieved November 21, 2012. ↑ Graham, Jamie (October 26, 2012). "Amour review". Total Film. Future Publishing. Retrieved November 19, 2012. ↑ Calhoun, Dave. "Amour review". Time Out. Retrieved 21 November 2012. ↑ Scott, A. O. (14 December 2012). "25 Favorites From A Year When 10 Aren't Enough". The New York Times. Retrieved 14 December 2012. ↑ Dargis, Manohla (18 December 2012). "Étude on Aging, Its Graces, Its Indignities". The New York Times. Retrieved 18 December 2012. ↑ Morgenstern, Joe (20 December 2012). "Luminous, Loving 'Amour'". The Wall Street Journal. Retrieved 20 December 2012. ↑ Marsh, Calum (2012-10-02). "Amour". Slant Magazine. Retrieved 11 January 2013. ↑ "Amour (2012) - Box Office Mojo". ↑ "2nd AACTA International Awards Nominees". Australian Academy of Cinema and Television Arts (AACTA). 9 January 2013. Retrieved 9 January 2013. ↑ "2012 EDA Award Nominees". Alliance of Women Film Journalists. Retrieved 28 December 2012. ↑ "Winners of the Bavarian Film Awards". Cineuropa.org. Retrieved 10 February 2013. ↑ "Bodil-prisen 2013". Bodilprisen.dk. Retrieved 10 February 2013. ↑ "2012 Winners". Boston Society of Film Critics. Retrieved 10 December 2012. ↑ "Bafta Film Awards 2013: The winners". BBC News. 10 February 2013. Retrieved 11 February 2013. ↑ BFI. "The Master tops Sight & Sound's Best of 2012". British Film Institute. AwardsDaily.com. Retrieved 2 December 2012. ↑ "British Independent Film Awards". Retrieved 7 December 2012. ↑ "Imposter Among Early Winners at British Independent Film Awards". Retrieved 10 December 2012. ↑ "38th César Award Nominations" (PDF). academie-cinema. 2013-01-26. Retrieved 26 January 2013. ↑ ""The Master" rules 2012 CFCA Awards with 10 Nominations". CFCA. 2012-12-14. Retrieved 14 December 2012. ↑ "Critics' Choice Movie Awards". The Broadcast Films Critics Association. Retrieved 11 December 2012. ↑ Jones, Arnold Wayne (2012-12-18). "DFW Film Critics bestow 2012 awards". Dallas Voice. Retrieved 18 December 2012. ↑ "Award-winners Announced At Durban International Film Festival 2012". University of KwaZulu-Natal. Retrieved 18 August 2012. ↑ "The 25th European Film Awards: Winners". Retrieved 2 December 2012. ↑ "Michael Haneke's Amour, winner of the FIPRESCI Grand Prix". Retrieved 30 November 2012. ↑ Mitchell, Robert (2012-09-05). "Int'l crix love Haneke's 'Amour'". Variety. Retrieved 5 September 2012. ↑ "2012 Awards". Georgia Film Critics Association. Retrieved February 19, 2013. ↑ "2013 Golden Globe Nominations". HFPA. 2012-12-12. Retrieved 13 December 2012. ↑ "Golden Globes: Ben Affleck's Argo scoops two awards". HFPA. 14 January 2013. Retrieved 14 January 2013. ↑ "The 60th MPSE Golden Reel Awards nominees". Los Angeles Times. 17 January 2013. Retrieved 14 February 2013. ↑ "Nomineringarna till Guldbaggen" (in Swedish). Sydsvenskan.se. Retrieved 3 January 2013. ↑ "Lincoln leads Houston Film Critic Society Awards with eight nominations". AwardsDaily.com. Retrieved 10 January 2013. ↑ "Spirit Awards 2013". Retrieved 28 November 2012. ↑ "Winners of the 10th Annual Irish Film & Television Awards". Retrieved February 17, 2013. ↑ "Kansas City Film Critics Circle Awards". KCFCC. 2012-12-16. Retrieved 16 December 2012. ↑ "2012 Sierra Award winners". LVFCS. 12 December 2012. Archived from the original on 17 December 2012. Retrieved 13 December 2012. ↑ "The Circle Film Awards 2012 NOMINATIONS". LFCC. 2012-12-18. Retrieved 18 December 2012. ↑ "Amour bags hat-trick of London Critics' Circle Film Awards". BBC. 2013-01-21. Retrieved 21 January 2013. ↑ "38th Annual Los Angeles Film Critics". LAFCA. December 5, 2012. Retrieved 10 December 2012. ↑ "Prix et nominations : Lumières de la presse étrangère 2013". AlloCiné. Retrieved February 20, 2013. ↑ "National Board Of Review Best Film: 'Zero Dark Thirty'". Deadline.com. December 5, 2012. Retrieved 5 December 2012. 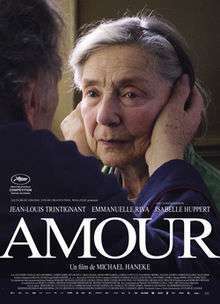 ↑ "2012 Awards: "Amour," Emmanuelle Riva, Daniel Day-Lewis". National Society of Film Critics. January 6, 2013. Retrieved 5 December 2012. ↑ "NYFCC - Best Foreign Film Awards". Retrieved 3 December 2012. ↑ "Kathryn Bigelow and Steven Spielberg win New York Film Critics awards". BBC News. 4 December 2012. Retrieved 4 December 2012. 1 2 "The gory details of the New York Film Critics Circle vote". Variety Media, LLC. Retrieved 7 December 2012. ↑ "Oklahoma and Nevada Critics sound off". AwardsDaily.com. Retrieved 3 January 2013. ↑ "2012 Awards (16th Annual)". Online Film Critics Society. Retrieved 10 January 2013. ↑ Adams, Ryan (11 December 2012). "Phoenix and Detroit Critics join the mix". Awards Daily. Retrieved 11 December 2012. ↑ "NOMINACJE DO ORŁÓW 2013, DOROCZNYCH NAGRÓD POLSKIEJ". Polskie Nagrody Filmowe. Retrieved 11 February 2013. ↑ "Le Prix Louis Delluc récompense Benoît Jacquot pour ses". toutelaculture. 2012-12-17. Retrieved 17 December 2012. ↑ "San Diego Film Critics Society 2012 Awards". Retrieved 11 December 2012. ↑ "2012 San Francisco Film Critics Circle Awards". SFFCC. 2012-12-16. Retrieved 17 December 2012. ↑ "17th Satellite Awards Nominations". International Press Academy. Retrieved 5 December 2012. ↑ "Southeastern Film Critics Association Awards: 'Argo' Best of 2012; 'Zero Dark Thirty,' 'Lincoln' Runners-Up". The E.W. Scripps Co. Retrieved 20 December 2012. ↑ "The Best Movies of 2012". Toronto: The Atlantic Monthly Group. Retrieved February 21, 2012. ↑ "2012 The Village Voice Poll". Village Voice, LLC. Retrieved February 21, 2013. ↑ "Toronto Film Critics Association Announces 2012 Awards". Toronto Film Critics Association. Retrieved 14 February 2013. ↑ "Utah Film Critics Winners". AwardsDaily.com. Retrieved 20 December 2012. ↑ "Lincoln Leads Vancouver Film Critics". AwardsDaily.com. Retrieved 27 December 2012. ↑ "The 2012 WAFCA Award Nominees". Retrieved 9 December 2012. ↑ Kevin Jagernauth (December 1, 2012). "Paul Thomas Anderson's 'The Master' Tops Sight & Sound's Best Of 2012". Retrieved 1 December 2012. ↑ Bradshaw, Peter (12 December 2012). "The 10 best films of 2012, No 3 - Amour". London: The Guardian. Retrieved 12 December 2012.